I am not usually one for field photographs — I am not a geologist, and one bit of rock looks the same as any other to me. I suffer from a debilitating condition that renders me unable to see fossils in the ground, and am reliant on other people to dig ’em out, clean ’em up and reposit them before I’m able to make ’em into science. 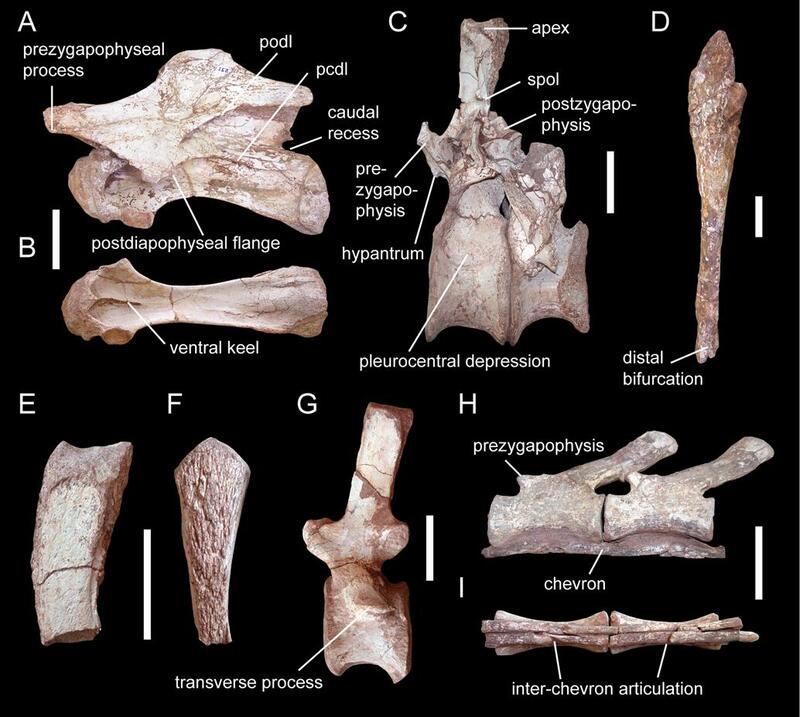 It’s the astonishingly complete and well-preserved type specimen of a new basal sauropod, Spinophorosaurus, that came out today in a paper lead-authored by Kristian Remes, previously best known for his work on Tendaguru diplodocines (Remes 2006, 2007, 2009) and for his work on the awesome remounting of the Berlin brachiosaur. Finally, here is the skeletal reconstruction: as you can see, it’s a decent size for such a basal sauropod. Note the freaky all-osteoderm tail-club. A truly amazing specimen — I am looking forward to sitting down with the paper and giving it the attention it deserves. Matt Wedel: That animal is just flat badass. Zach Miller: It has a goddamn thagomizer!!! Remes, Kristian. 2006. Revision of the Tendaguru sauropod dinosaur Tornieria africana (Fraas) and its relevance for sauropod paleobiogeography. Journal of Vertebrate Paleontology 26(3):651-669. Remes, Kristian. 2007. A second Gondwanan diplodocoid dinosaur from the Upper Jurassic Tendaguru Beds of Tanzania, East Africa. Paleontology 50(3):653-667. Wow! That thing is beyond cool. Also… that bone quality is absolutely crazy. Looks like you can practically just pick up. By the way, I thought that there was some sort of rule these days against giving a dinosaur a good (i.e. Latin- or Greek-rooted) name. Love to eat them spinophorosauruses; Spinophorosauruses what I love to eat; Bite they little heads off, nibble on they tiny feet. … and cervical ribs, too, I guess. If it’s basal, wouldn’t it have had phalanges? I wrote that article based on a preview PDF before the formal publication of the article, and therefore before the full-resolution images were posted on the PLoS site. Now they’re up, take a look at the big Figure 3. Fantastic! The “high”-resolution figures at Palaeontologia Electronica make rather a sad contrast: for example, consider Rose (2007:fig. 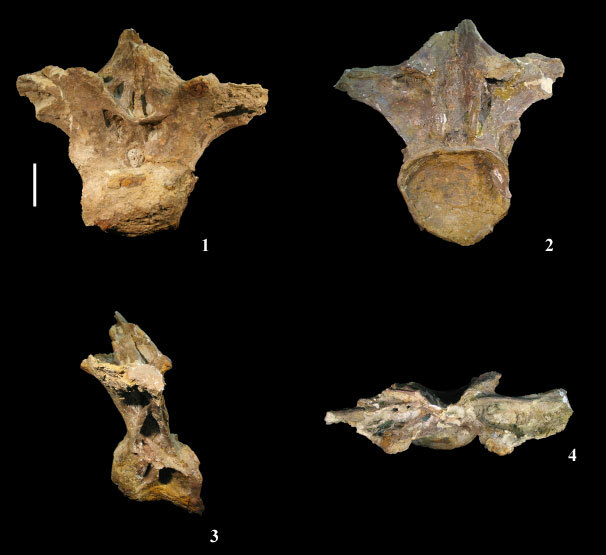 12), the dorsal vertebrae of Paluxysaurus. So far as I can see, that’s the best version they have of the figure. Come on, PE! You’re an electronic-only venue — get your finger out and give us full-resolution figures! Phalanges are shown in the reconstruction. uber awesome! The paper is great and so are the figures, although I wish there would have been more of them. 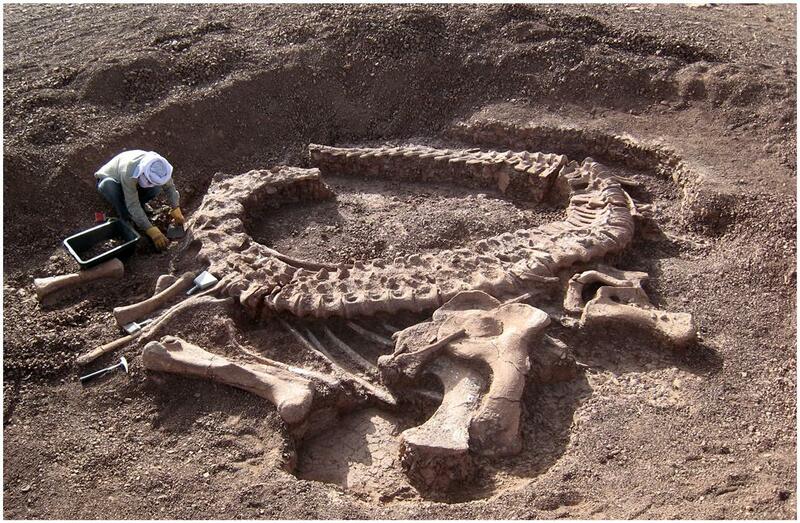 Hmmm…basal sauropod with excellent, well preserved and fully exposed complete vertebral column. Aside from that: awesome beast, I just wish Kristian had given me a sneak preview. but then, he probably did not know I am right now writing papers about thagomizers. David: Is it really a thagomizer, or analogous to a thagomizer? I.e., are you suggesting the structure is plesiomorphic, but frequently lost? I suppose Heinrich can tell us a lot about this. Like an arctometatarsus or a tail club, a thagomizer is description of an anatomical condition. Said condition might (and indeed has) evolved more than once. As Tom points out, ‘thagomizer’ in the original definition refers to an anatomical feature. The tail spikes of a Stegosaurus not as a part of the animal’s genetic heritage, but rather as ‘the thing the animal hits you with that kills you’. That much is quite obvious from the original drawing. But yeah, dinosaur tails are amazingly conservative, and it is to be expected that such long, flexible, muscular (thus easily acceleratable) things are used for hitting. Crocs do it, monitors do it – why should we not expect several linages to put a few hard and spiky things on the end? Gives a tremendous whack! Certainly interesting, and with the skidded distal tail, it does suggest there was a funky thing going on with it. With the large size of the bases of the spikes, I would not actually place them so distally, however. In Shunosaurus at least, the distal tail is composed of inflated vertebrae; interlocking chevrons are found in ankylosaurus, sue, but they are also found in oviraptorosaurs like Nomingia in which we cannot actively assume there was a thagomizer or a club, or any such thing. 1. It increases the stride-length of the forelimb — or would if we had an accurate way to assess stride-length in these taxa so far, which we do not — and in animals with relatively equal fore and hind limbs, or with taxa with loinger fore than hind limbs, this skews the posture and stride somewhat. 2. With the distal scapula NOT exceeding the height of the dorsum, this pushes the fore-section of the body vertically. There is currently no evidence for this as well. 3. This is done without resource to the argument that the dorsal ribs produce a system of facets that run obliquely to the main vertebral axis and correspond more or less to the region where the scapula resides. 4. The glenoid margin of the scapula is often straight, while the coracoid margin is equally robust and curved. Remes places all the weight-bearing on the scapula, and none on the coracoid. This seems like it could be resolved using CT techniques in determining bone density to compare where the bone is most likely to be loaded, and this can also be investigated with FEA. I understand there may or may not be a motive to make the dorsal column as inclined as possible, and to elevate the neck as far as possible (especially with the Humboldt mount, in which a political motive to having the “tallest mount in the world” may be a little pushy). Near-vertical scapula orientation in sauropods was proposed, and discussed at length, in Schwarz, Daniela, Eberhard Frey and Christian A. Meyer. 2007. Novel Reconstruction of the Orientation of the Pectoral Girdle in Sauropods. The Anatomical Record 290: 32-47. doi:10.1002/ar.a.20405. I image that as part of the same group, Kristian was influenced by their arguments. It’s silly to suggest a “political” motive for this reconstruction: that SII mount would be the tallest in the world whatever orientation you put the scapulae in. For what it’s worth, while I agree that putting the whole forelimb load through the scapula and leaving the coracoid out of the equation seems to make no mechanical sense, the scapulae of the SII mount look right in relation to the ribs, and the whole remounted skeleton “feels right” (for whatever little that may be worth) in a way that Janensch’s mount didn’t, to me. Finally on this, it seems weird to me that we talk about “scapula orientation in sauropods” as though we’re convinced a priori that it was the same in all sauropods. Given the diversity, disparity and longevity of the clade, that seems very unlikely to me. While I’m sure there is indeed a “world’s tallest dinosaur skeleton” motive behind the Humboldt specimen’s erect neck, I do NOT beleive that the postrue is one that would have been impossible for the reptile to acheive in life. And with Taylor, Wedel and Naish (2009) and all that, I actually beleive that the elevated neck of the Humboldt mount was probably a commonly assumed position, especially while feeding. And on an unrelated note, why is it that everyone seems to reject the notion of rearing brachiosaurids? Even with those long forelimbs, they were still primarily hindlimb dominant (or at least Giraffatitan should have been), and since even fully forelimb-dominant elephants can rear, what’s the big deal? Where, exactly, would you place them? Bakker is said to have commented, on the subject of sauropods rearing, that he is pretty sure that at least the males did sometimes. Could an adult brachiosaur rear? Just possibly? Would it? I would think very very rarely. If it can reach up 15 m from a quadrupedal base, why take the huge risk of rearing to reach maybe 18 m? Perhaps in an extreme famine. Just because the proportions in brachiosaurs are less disadvantageous than in elephants doesn’t mean it was easier for them — absolute size is an important factor, too. Anyway, SV-POW! regular Heinrich Mallison has the brachiosaur rearing problem well under control and should hopefully have a paper out soon telling us all we need to know. In our rush to make every part of the sauropod appendicular skeleton play some role in bearing weight, let’s not forget that practically all of the bones of the postcranial skeleton also serve as muscle attachments, and this is particularly true of girdle elements like coracoids. Sure, but the coracoid does have this massive, broadened, weight-bearing-looking glenoid facet. You have to admit that it looks suspicious. On a serious note, I can’t wait for that paper! Surely the AMNH _Barosaurus_ mount is similar in height? The only stat I can find online is 55ft tall including the base, which IIRC isn’t more than a meter high. Interesting…particularly in the context of political motives for dinosaur reconstructions. The AMNH Barosaurus is a great mount, but it’s got one more cervical vertebra than B. is now thought to have had (17 vs 16), and two more than B. was thought to have had at the time it was mounted (i.e., 15, like other diplodocids). So it’s probably close to a meter overtall even now. Good point on the AMNH Barosaurus — I’d quite forgotten that. the tall AMNH mount is a cast, so no count. Half the height of the Berlin mount is not even a cast, it’s a sculpture (albeit a sensationally good one) — are you going to count that out, too? no, I do not count out mounts of real material where impossible-to-mount parts are replaced by RP replacements. The difference between AMNH Baro and MFN Giraffatitan is quite simple: one is a pure cast, the other is a skeletal mount as far as practical, and a cast only where mounting real material is not prctical. Earlier, I was sent to review Schwartz, Frey and Meyer on scapular orientation in sauropods. Not only did this paper not address the issue I raised when it was brought up (congruence of the scapula to the lateral “fossae” on dorsal ribs); it produces a theory of the orientation that is formed through three assumptions: 1) The sternal ossifications, despite lacking a medial contact margin as in theropods, contacted one another on the midline or so closely that when cartilage is reconstructed between them, it is minimal, from which point the sternal plates are aligned more or less with their long axes parallel (this skews the orientation of the coracoids); 2) The dorsal vertebrae, and consequently the ribs with which they are articulated to, are position using ONP (which the readers of this blog and its writers have noted before); and 3) that when the trunk width increases between dorsal ribs 1-4, before rib 5, the scapulocoracoid must have been limited to this area, as in none of the reconstructed does it extend past rib 4. 1. It is an easy assumption to make that the sauropod sternae are aligned with their long axes parallel, but unlike in theropods, sauropod sternals are curved on their medial margins, which produces a largely speculative position for the sternal/coracoid contact, and the relative orientation of said contact in all three dimensions. Schwartz et al. continue this assumption by placing the long axes of the sternals on a parallel line with the distal ends of the first set of dorsal ribs, yet their own model of birds refutes this: birds for the most part have a sternum that diverges posteriorly from the line formed from the distal ribs, while in crocodilians and lacertilians, the sternum converges towards the distal ribs, even though the sternal ribs increase posteriorly (due to a “pear-shaped” trunk in either with a posteriorly broadening trunk and laterally deflected ribs in the midtrunk in lacertilians and crocodilians, unlike in sauropods or birds). Birds, unlike crocodilians, lack indepedantly-mobile scapulocoracoids (in relation to the fore-aft locomotory module), and development of the sternal pump requires that the sternal ribs, distal dorsal ribs, and sternum form two pairs of complex hinges in which the chest cavity is expanded and depressed, which I find hard to replicate as easily in sauropods (my fault, I am sure). 2. The readers of this blog are familiar with the issues regarding ONP, and I am sure that there is no speculation here regarding using an osteological neutral posture of the dorsal column being “problematic” when associating ribs. With an increased dorsal curvature (as proposed by Wedel et al.) the distal dorsal ribs would be splayed outwards and/or increase the distance between the anterior ribs and/or elevate the line formed from the distal ends of the anterior dorsal ribs. This causes the chest model to be altered to the point that the scapula becomes either more vertical as the dorsum elevates (where cohesion of the ribs becomes evident) or less vertical as the ribs become splayed out and the distance between ribs 1-4 increases or the orientation of the sternal complex is rotated less horizontally. Elevation of the dorsum results in a reorientation of the sternal complex, nonetheless, and this skews Schwartz et al’s proposition if Wedel et al are correct in assuming “alert posture” is more dominant a reconstructive option than ONP (and as opposed to a behaviorally normative active/feeding posture). 3. It is not so much that the position of the ribs are assumed to be parallel, when many reconstructions show the first set to be largely swept posteriorly, but that the issue with the lateral scapular fossa of the ribs is not mentioned (work in progress?). However, it seems tricky to hinge your scapula ONLY to the anteriormost dorsals when your scapula is so widely distinct from that of the animals you are using to establish it into position. A large, massive scapulocoracoid along with elongated, nearly vertical ribs with slab-sided ribcage are unknown outside of the sauropods, as even their so called analogues such as giraffes and elephants have rounded ribcages and nearly vertcial yet smaller scapulae. Are we here to assume that because mammals and lacertilians and crocodilians (and not to forget turtles!) have largely vertical scapulae, that dinosaurs must have as well? There is a point you can take anatomical comparisons, and some are simply incomparable when applied to the sauropods. At which point do we place sauropods outside of the “copy and paste” model of anatomical comparison, when real differences are sidelined? Where in this work did Schwartz et al note that birds, which their scapulae being perpendicular to the ribcage but parallel to the ground vs crocodilians with their scapulae being perpendicular to the ground but skewed relative to the ribcage? Fixed versus mobile? you again talk about the ‘fossae’, but you again do not give a reason why they should correlate to scap position. Please? Furthermore, you extensively criticize Schwarz et al. – have you read Remes? He gets very similar conclusions with regards to the issues you criticize. Also, articulations in birds do not ‘refute’ anything in a sauropod model, at most you can claim that EPB ‘does not agree’. It is tempting to use extant animals as ‘the truth’, but both birds and crocs are so far from sauropods that an EPB approach alone is doomed. Or do you wish to claim that the re-adoption of a sprawling pose or the development of flight will not significantly alter the mechanics of the shoulder girdle? What you need to do is do what Remes did: use EPB and reconstructions of as many ancestral taxa as you can. Let’s instead look at a taxon closely related to sauropods: Plateosaurus. Here, the first five dorsal ribs differ significantly in shaft cross section from those further back. They are broadly elliptical, while posterior ribs are round. Furthermore, the first few hinge forward-backward, while posterior ribs hinge forward&out-backward&in. Conclusion: scaps do not go beyond rib 5. Otherwise, given the medial contact between the coracoids (articulated skeletons found – don’t go claiming there was much room between them. Sternals are posterior to them), each breath would flex the pectoral girdle, significantly moving the glenoids. Now, I do not give a flying piece of feces for bird ribs, scaps, and coracoids when thinking about sauropods when I have evidence from closely related taxa that is so telling. Wedel et al is who? Taylor et al? If so, they talk cervicals, not dorsals….. In Plateosaurus, ONP of the anterior dorsals agrees very nicely with ribcage shape, if the ribs are assumed to incline posteriorly as seen in articulated finds of dinosaurs in general. Sadly, no Plateosaurus does us the favor of being recovered undeformed, otherwise the case would be clinched now. But then, there is F33 (from Trossingen, today at SMNS). Embedded on its belly, it is the sole specimen that does not show torsion of the anterior body. Thus, compation was purely dorsoventrally. And the scaps stick straight up. I can come up with scenarios where a sub-horizontal scapula is rotated by 60 or more degrees to be embedded vertically IN ARTICULATION, but it is far far easier if it was sub-horizontal to begin with. Do you really want to argue that sauropods must not only differ with regards to scapula position so much from what evidence you get from extant animals, but should differ significantly from their closest relatives as well? Sources: Mallison in press, in review, in review. Contact me at SVP to see the figures. The feeding range of sauropod dinosaurs was constrained by the height of the base of the neck, which was itself constrained by the nature of the articulation between the scapulocoracoid and the trunk. Sauropod scapulocoracoid orientation and mobility remain controversial because no tight, bony articulations were present between these bones and the vertebral column, and few osteological markers are available to constrain shoulder orientation. Previous hypotheses of scapulocoracoid position in sauropods were inferred from death poses or through simple goodness-of-fit criteria, but were not developed within a phylogenetic context. We examined the scapulocoracoids, ribcage, and sterna of several neosauropods, basal sauropodomorphs, extant archosaurs, and lepidosaurs in order to: 1) assess the soft tissue contributions to scapulocoracoid orientation and mobility; and 2) determine osteological correlates associated with shoulder position. Archosaurian scapulae vary in position from nearly parallel to the vertebral column (birds) to nearly vertical (crocodilians) but in all cases the scapular blade is nearly parallel to the top of the neural spines along its distal extent, suggesting a similar orientation in dinosaurs. Positions and homologies of the musculature supporting the scapulocoracoid were conservative within taxa. Scapulocoracoid movements against the sternum, affected by the Mm. serratus, levator scapulae, and sternocoracoideus groups, become more restricted in archosaurs, particularly in birds. Flattened areas on the external surfaces of the dorsal ribs (“facets”) are present in birds, sauropods, and other dinosaurs but are absent in crocodilians. Dissection and CT-scan data show that the scapular blade bows away from the dorsal ribs in Alligator whereas it lies in close contact with the dorsal ribs in birds, which may explain the lack of “facets” in crocodilians. Rib facets correlate with the neutral orientation of the scapular blade in birds. We suggest the presence of rib “facets” and the more restricted movements of the scapulocoracoid in diapsid outgroups support a constrained, sub-vertical orientation of the pectoral girdle in sauropods. I understand this isn’t as elegant as some other work you guys are doing, and one of the authors is the head of project that you guyts wrote a paper trying to debunk, but I would consider this at least somewhat important. Note also that I did not say that the “fossae” or “facets” are direct analogues, but have used it to confer speculative reasoning at least as strong as Schwarz et al.’s speculative reasoning. Oh, and thanks for fixing my missing html tags in my previous post. Well aside from all the scapular angle controversy, has anyone noticed that this weird sauropod also seems to have a wishbone? That thing just looks ODD, I didn’t think sauropods needed such a thing, and it’s such a birdlike feature on a very un-birdlike dinosaur. Is this the ONLY case of a sauropod having such a structure? And what does it mean for the movement of the arms? it has a clavicle, but not a furcula says the article. And those are known from quite a few prosauropods and sauropods. re Jamie: thank you for the answer. Now the big question (again): what is the functional connection? I see scap on facets in birds, but I do not see the reason. correlation is not causation. Facets may be related to a muscle, and the scap may happen to rest on top of it. btw: nobody here is ‘out to debunk Kent’. We are out to duplicate, and, if possible and necessary, improve his work. That’s called scientific progress. Kent is a very nice, kind guy for whom I have the highest respect. Especially since he has a daytime job in a different field, and can only ‘moonlight’ in paleo (same is true for Mike, btw). Let me just chime in with a big Amen to Heinrich’s comments on Kent Stevens. I hope we’ve made it clear in our paper, posts and comments that we think DinoMorph is a really important tool and a real step forward — and it’s only because we think it’s so important that we are so frustrated at the lack of rigour and reproducibility in how it’s been used so far. One of the best outcomes we could wish from our own recent paper on neck-posture would be for it to provoke more, and more careful and detailed and reproducible, work on DinoMorph. On top of all that, Kent is a nice guy who’s been unfailingly polite and helpful to us as we’ve tried to work through neck-posture issues. That we disagree in our conclusions doesn’t change that! While the abstract (and poster) appear to indicate that crocodilians lack the factes, while birds (and sauropods) have them, one principle aspect may be responsible: Factes appear where scapular position is fixed, i.e, that the scapula was situated at this position without the ability to move around. The shoulder is very mobile in lacertilians and crocodilians, but largely relatively immobile in birds (with only fore-aft movement occuring for the most part). If this correlation holds true, it means that the scapula does not rotate around an axis in the sagittal plane. And that has BIG implications for scapular and therefore should motion. Note that the orientation of the scapula in Bonnan et al.’s Apatosaurus is similar to that in Schwarz-Wings et al.’s Diplodocus; it also appears to oriented the dorsum above the horizontal, sloping to the pelvis. How this effects other reconstructiosn however could be significant. Remes’ mount for B. brancai shows a disconnect between the rib facets and the scapula, so that if these factes preclude scapular position, then the mount’s forelimbs may be too far forward. Heinrich, having seen some of your animations at the 2004 SVP, we can certainly be curious if relative position of the shoulder and the stance (as forelimb distance from hind) may effect the sauropod dropping from a rearing position. The reason these things matter is that all of these things influence the organism on the whole, up to and including the relative ecological arguments, the “sexification” of sauropods rather than the practical work, the “cut and pasting” of extant to extinct organisms by a variety of workers whom at the same time use these animals’ biologies to argue uniqueness in their studied groups, and the realtive ignorance of biomechanics on a broader scale that has so far been relegated to the sidelines in favor of much more speculative comparative work including (of all things) behavioral work. I think I’ll withhold comments regarding the comparisons between Steven’s work and Wedel et al. until his argument is fleshed out. There is wholly too much to say that a response here should ever have been made (by myself) that I could write a paper simply waving my arms around about it. Do you have a photo that shows this? I wasn’t aware of it when working with this skeleton in Berlin — but then I wasn’t looking for it, and didn’t notice any facets on the lateral surfaces of the ribs at all. Yes, the scaps are not on the facets, the raison de etre of which is still unknown. now, I know of ‘facets’ that are nothing but imprints of the scap caused by post-mortem compaction, but the ones Jamie talks about are actually not only facets. In fact, the rib shafts in that area have a different cross sections (flattened, wider). And THAT for me points directly at muscle attachment. Why oh why would the scap’s presence lead to a change in the morphology of an rib that is actually separated from it by muscles? Also, there is a distinct coracosternal joint in Alligator, and scap rotation happens. In birds this is gone – what are we gonna do about sauropods? The relevant parts are all cartilage, thus gone – must we now assume its presence or absence? While I’ve enjoyed following the “scapular angle” debate, I belive a more important question for science is this: What did Spinophorosaurus taste like??? Teriyaki? My argument is not an opposition to your philosophy, but an attempt at comprehension when it comes to the multitude of data involving the data. On one side you have the idea that sauropods can be like any living group, regardless of the distinctions, but should be compared only thus far because they are the only models from which we may derive explicit knowledge; on the other, we have the idea that only detailed osteologic and musculatory study can reveal anything but until then, NO reconstructions should be made. I stand in the middle on this issue, as I suspsect most of you, but I approach this from the biomechanical side, rather than the “living-homologues” side. I want explicit biomechanics to be the first priority on reconstruction, but this requires that we overtly question our own assumptions on what is appropriately applicable in our theories. There are issues with the neck-inflation-as-cervical-lift theory put forward by Kellner et al., but at least it’s testable. “Sauropods are a cross between crocodilians and birds” is not a testable theory, even if that is the explicit EPB from which we have to work with. The latter tells us nothing about how we should approach reconstruction or lifestyle, while the former is only nuts and bolts. But the latter does gives us an insight, in Hutchinson’s (paraphrased) words, how something couldn’t happen. I approve fully of being overtly critical of all of these studies, and would think so should everyone else. Keeping a mount large, impressive, tall, and perhaps more impressive than the competing theory of ONP suggests IS political, at least to a degree. I am not saying this work is ONLY political, but I think it is foolsih to argue there is NO politicism involved. On one side you have the idea that sauropods can be like any living group, regardless of the distinctions, but should be compared only thus far because they are the only models from which we may derive explicit knowledge; on the other, we have the idea that only detailed osteologic and musculatory study can reveal anything but until then, NO reconstructions should be made. I stand in the middle on this issue, as I suspsect most of you, but I approach this from the biomechanical side, rather than the “living-homologues” side. This is an old argument that Matt and I have had a hundred times. His inclination is to look at what extant analogues do and then ask whether it’s mechanically feasible; mine is to ask what we can deduce mechanically and then see whether anything alive today works similarly. In practice, this clash works really well, because when either one of us proposes something really dumb (more often me than Matt, needless to say) the other usually smacks it firmly down before it sees the light of day. Say what again? I must have missed that. Reference, please! The only paper I know of that sounds remotely like this is Schwarz-Wings, Daniela, and Eberhard Frey. 2008. Is there an option for a pneumatic stabilization of sauropod necks? – an experimental and anatomical approach. Palaeontologia Electronica 11 (3): 17A (26 pages). With the recent flurry of bizzare sauropods and stegosaurs (Miragaia, Spinophorosaurus), and the ones already discovered (Brachytrachelopan, Shunosaurus), one can only conclude that the sauropods and stegosaurids must of had a convention in the Middle Jurassic and ended up cribbing off of each other. ..but I have an alternative theory..
« To B.b. or not to B.b — or — So what is a “genus” anyway?